To get everybody up to speed, I’ll briefly go over why I started the business and the model I chose. As I write this, I opened the doors to Full English Post, an audio post house, fourteen months ago and couldn’t be happier that I did. 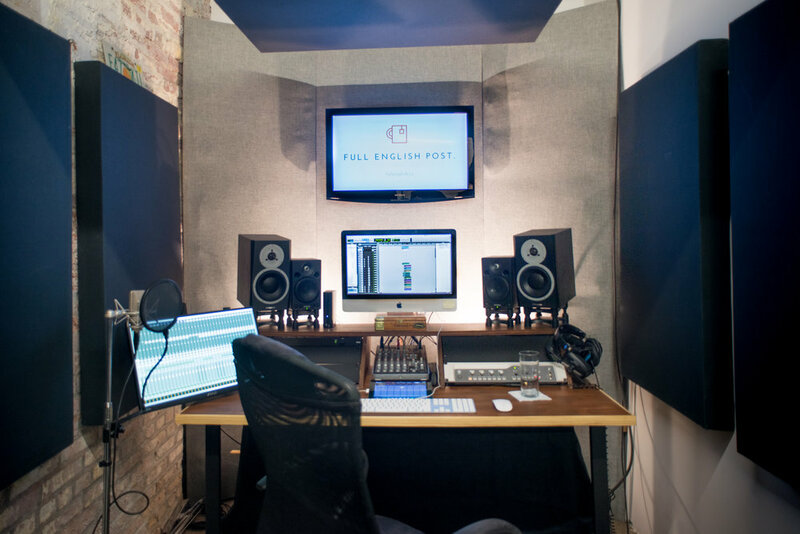 The company offers recording, sound design, and mixing for branded and commercial content as well as films, docs and trailers. The advertising industry is both directly and indirectly responsible for much of the company income. My clients are generally creative and production agencies, here’s how I strategically positioned my company to offer excellent value to them for the premium services I provide. Most industries are constantly changing, growing, and mutating to keep up with varying climates. The advertising industry is no exception and it’s no news that the “Mad Men” days of large expense accounts and superfluous production spending are coming to an end. Of course those large advertising budgets still exist and that ‘old world’ is definitely still present but it’s on it way out. Or at the very least it’s transforming into a different dynamic. A huge splatter of ink on the wall that the ad agency model is being rocked was the news that P&G are looking to reduce much of their ad agency costs and aiming to cut $2 Billion in marketing spend in the next 5 years. This will trickle down through the production and post production stages ultimately affecting vendors like myself. Many brand’s overall spend on advertising production is being reduced or distributed differently, yet there is much more demand for advertising. Marketers have better audience targeting analytics to tailor content efficiently and more platforms to sell on than ever before, but does this mean that production quality has to suffer if the budget is spread more thinly? Absolutely not. Production costs can be vastly reduced with ever advancing filmmaking technology (cheaper, better cameras, lighting etc.) as well as more ‘boutique’ production vendors offering great value. Smaller companies can now work remotely or away from the major geographic hotspots cutting brick and mortar company costs but still offer premium quality content. A lot of top creative directors and filmmakers have left larger agencies to start their own production companies meaning brands are literally getting the same creative and production people for less by cutting out middlemen. This is not to say ad agencies don’t still serve a vital role, and they are certainly not disappearing anytime soon, it just means that the times are changing. It’s because of this dynamic adjustment that I designed my business model the way I did. I started Full English on the premise that inevitably advertising campaign budgets will get cut or assigned differently as brand finances get spread over the increasing demand for content production. Unfortunately, for that same reduced per-project budget, clients still of course strive for top quality advertisement, and why wouldn’t they. My question when writing a business plan was with production budgets lowered, where do I position my post production audio business? The obvious answer is to come in cheaper than the competition. But how do I achieve that and still keep my head above water and also not devalue the quality of the services I offer? Reducing overheads is key to accomplishing this. After all, I only offer a service and not a physical product which helps greatly in boiling down some of the business expense fat. The first step I took towards cutting expenses was by locating the studio in Brooklyn, immediately trimming rent costs compared to Manhattan. I know location is key, and Manhattan has always been the dominant borough of the five that make up New York City, but that stereotype is changing, especially for the advertising industry. Brooklyn - known for the birth of Roller Coasters, Biggie, and Hipsters - has always been a huge creative hub full of artists and entrepreneurs but never commonly known for advertising. Until now. A big flag that the industry is Brooklyn-bound was 72 and Sunny’s move to Empire Stores in DUMBO. A huge statement for New York ad agencies, the company realized that a majority proportion of their staff were commuting from Brooklyn, plus of course the savings on leasing expenses were phenomenal, so they moved. With plenty of other companies moving over the East River for similar reasons, it opens up huge markets for companies to thrive and exposes Brooklyn potential to those clients that may have previously overlooked working with a non-Manhattan-based company. When I first started the company I chose to work from a co-working space in Gowanus, Brooklyn for a number of overhead reducing reasons: Everything was included in the rent (internet, cleaning, beer, coffee, printing etc. ), a client-friendly building meant I could happily bring clients in, and shared workspaces have a great built-in network of potential clients. It was perfect to start a creative company from scratch and gave me a fantastic platform to elevate the company from all while keeping running costs down. A second major step to reducing overheads was reducing ‘fluff’ in the studio. I did this by writing down the equipment that I wanted and then crossed off everything that wasn’t absolutely necessary to get the job done at the highest possible quality. I made a rule that until a job required a certain piece of equipment or software I would hold off on purchasing it. An example was the 5.1 surround sound setup. I resisted the expensive studio enhancements until a job came in that couldn’t be done without the upgrade. I weighed up what the job was worth and the price of the upgrade. I calculated I would still make a profit after buying the hardware and software so I went ahead with the job. Now I am set up fully for 5.1 cinema and TV mixes plus I’m not out of pocket. I applied this frugalness to non-audio expenses too such as client niceties and the actual studio space itself. When I reached somewhat of a dead end physically with the space I was in, I moved the studio to a larger facility. While there were huge benefits to being in shared workspace, my unit itself was relatively small. I was getting to the point where I was having to tell clients that they could only bring two people into the studio. For the most part that wasn’t an issue but as my clients are getting bigger (both in prestigiousness and personnel) they are requesting more people attend the mix sessions. I searched for a comparable space that would not push my expenses over the limit in order for me to still offer my clients the same rates. Full English is now located at 1000 Dean Street, Brooklyn. The new facility offers over 4x more space that will give clients added comfort plus, the 5.1 surround sound and 360 VR spatial audio services have drastically improved with a larger acoustic platform. In looking for the new space, I discovered the Crown Heights neighborhood and found it has become a huge creative hub in the last few years with dozens of production and creative agencies in the 1000 Dean building alone, fundamentally improving business. While the building is not a shared workspace like the previous location, there is still a great sense of community here. The bad news is there is no longer beer on tap, the good news is that the rent is actually less which means I can buy my own beer...hooray beer! An added bonus to the new studio location is being in the same building as the wonderful folks at Smorgasburg with the awesome Berg’n offering booze, food and extremely good coffee - all without leaving the premises. Overall, fitting out a much larger post production facility has been exponentially beneficial for both business and comfort. Being surrounded by like-minded creative production companies opens up opportunity for collaboration and networking. Scaling the company up in this manner hit the goals I strived for after a year of being in business and I’m over the moon that I achieved them. 2018 brings bigger and better pastures and I’m excited to share more news with everyone as and when it comes in. If you’d like to see what Full English got up to last year have a look at past work here. I’d love for anybody interested in a studio tour to drop me an email or give me a call to arrange a suitable time.